Last weekend I had the chance to witness one of Spain’s most well-known traditions. I’d heard many reviews from my friends that had already seen a bullfight, with the most common theme being, “it was interesting to watch, but I felt dirty afterwards.” With that in mind, I wasn’t sure if I wanted to go, but it was the last match of the year last weekend so… I made an impulse buy, ok, alright. Entonces, ¡VAMOS A LA CORRIDA! I managed to convince my housemate Riccardo the Italian Stallion to come along, albeit his response was hesitant. 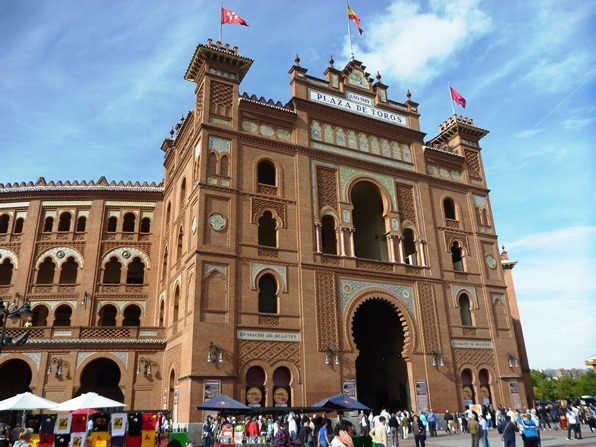 On the day of the fight, our Spanish housemate, Ana, learned of our plans and told us that it’s common for the matador (bull-fighter, literally translates to killer) to cut the ear off the bull during the fight to show off his technical skills, and throw the ear to the crowd. (She also told us the story of how her friend was in the crowd wearing white pants when a bull-ear landed on her lap). That was enough for Ricci, and he quickly bailed. 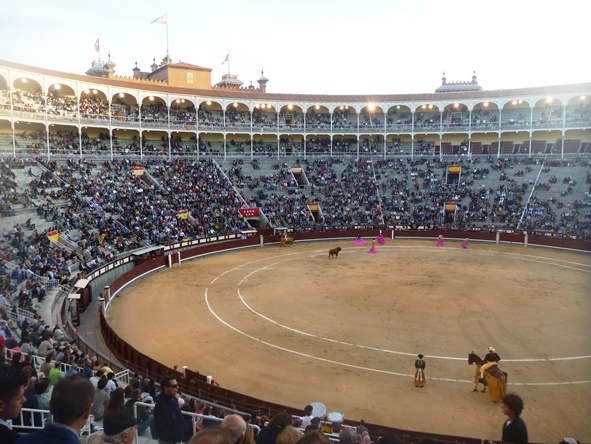 Fun fact: Bullfighting is becoming increasingly unpopular due to the people’s dislike of animal cruelty. So there I was, sitting in the stadium with my other friend that I invited, snacking on my chips, watching big-angry bulls run at red capes being dangled by men in fluro-pj’s. 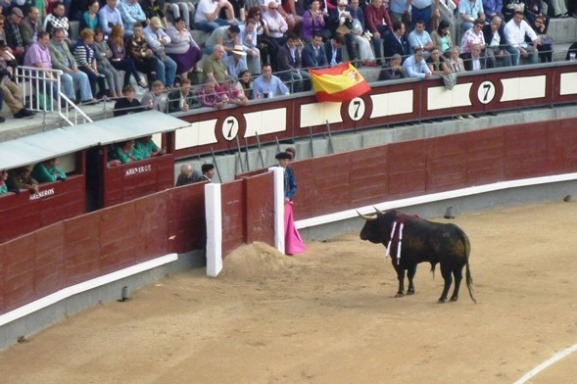 A bull charges at one of the toreros. The torero legs it. The torero hanging out in his safety corner. When he doesn’t have time to make it to the box, he jumps over the fence using the white ledge. 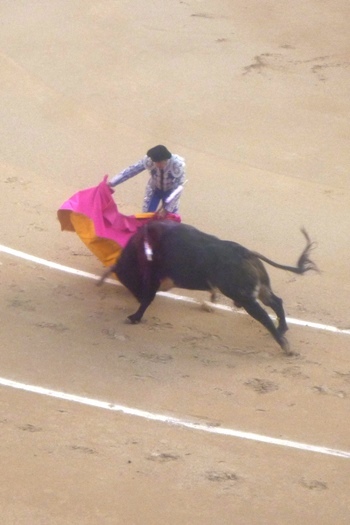 Despite their funny clothes, however, los toreros are actually crazy brave. An average bull can hook a grown man and toss him two-storeys high, and these men were getting so close to these beasts that their costumes were stained with the blood of the bulls from when the bulls brushed past them. They also had to get close enough to the bulls to perform the final act of stabbing them in the back, without getting hit themselves. In the end, the bull fight was really interesting. The bravery and skill of the toreros was remarkable, and the strength and endurance of the bulls was impressive. 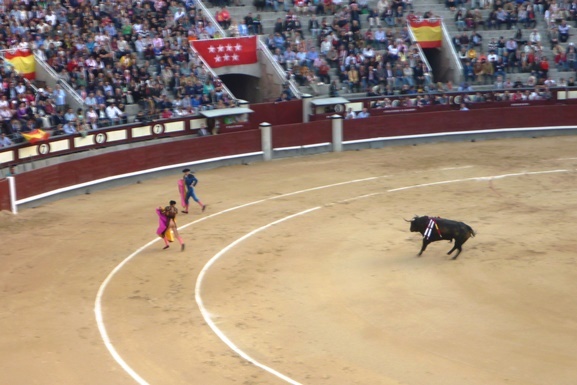 However, seeing six bulls being killed in front of me was a bit heavy… I think I’ll spend next weekend enjoying the Spanish traditions of tapas and siestas instead. 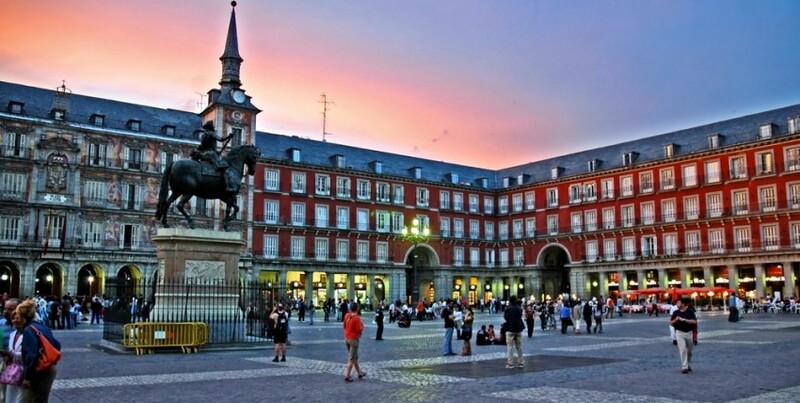 The bull-ring. An interesting show. A bull charges at the torero’s cape, getting nice and close. Wow that sounds brutal! I’m glad I could read your blog so I don’t accidentally go there one time! I hate this tradition with a passion 😦 Glad you’re doing well mate! I didn’t know you had a blog until now, so i’ll be sure to check it more often! Stay safe on your travels and have fun!